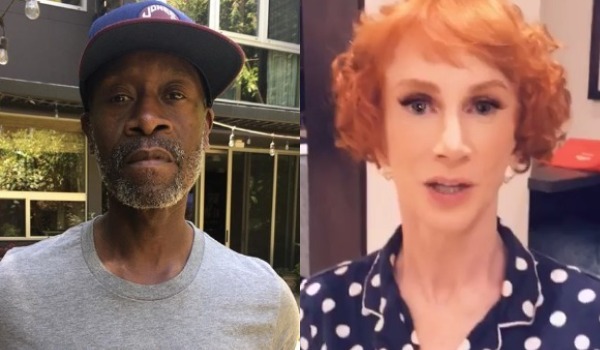 The comedian Kathy Griffin lashed out at Don Cheadle and got a well-worded response from the actor that was classy but sharp enough to shut her down. You may recall that Griffin posted a gory photo of herself holding a bloody, severed head of Donald Trump, which was heavily criticized by both the left and right. The President eventually responded, expressed his utter disgust and Griffin received a visit from the Secret Service. And that was after she apologized for the photo, then later retracted the apology. Griffin also lost her job at CNN as co-host of its annual New Year’s Eve show for the image, and these days she spends much of her career talking about it, claiming she was blackballed and blasting the people who haven’t stuck up for her. The comedian’s most recent target was Cheadle, who she called out on Twitter. The actor replied by simply writing “Huh?” but that only seemed to anger Griffin more. Cheadle responded by using seven different points and broke down why he found Griffin’s claims ridiculous. He also denied that he and the comedian are friends. “Two, had I been your friend and you had asked my opinion I would have said ‘Kathy, for your own sake, please do not depict yourself holding the bloody, severed head of the president, evoking Daesh, Daniel Pearl and every other painful, disturbing memory associated with it,’ your first amendment rights notwithstanding,” he added. Cheadle then told Griffin she should’ve expected a visit from the Secret Service and said it was ridiculous for her to think he would go on a media campaign to defend her, which was his sixth point.